Set includes 5 distinctive tools for the easy removal of body and interior fasteners, interior and exterior moldings, wheel hubs, etc. 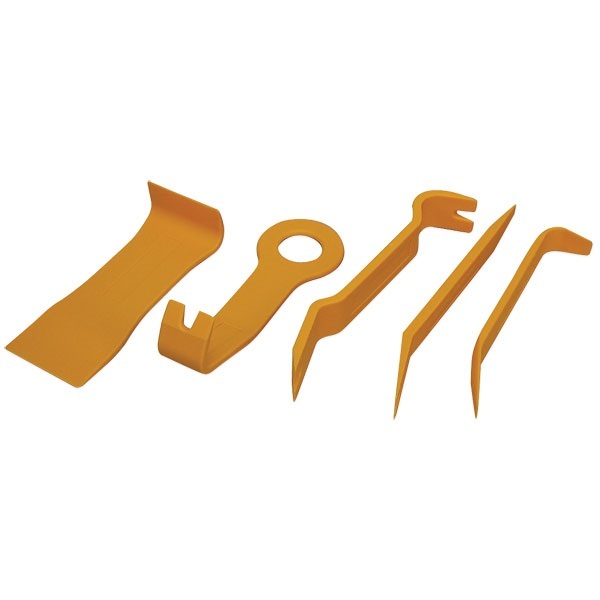 Heavy-duty plastic construction of tools prevents scratching and damage to vehicles, paint, or interior surfaces. Excellent set for any body man, stereo or upholstery installer, or any car enthusiast! l like curved shield,adj. works great,buy again!! When grinding and using cutoff wheels! The face shield & head gear are the best designed I have ever used. The quality is excellent and the molded curve of the face shield offers better protection and comfort. I reordered more of these face shields. I would like a tinted face shield option. Service & Delivery comments: I always receive fast shipping from TPp Tools and packages are always in good condition.